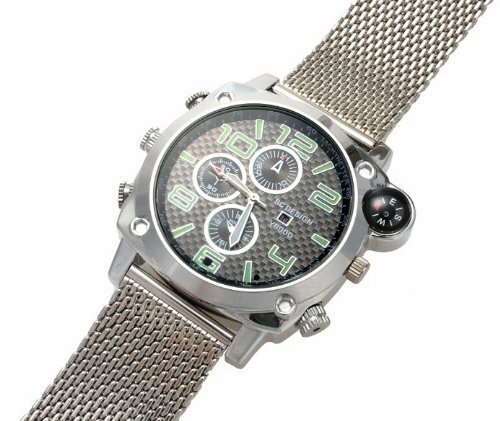 This spying watch is very elegant, it has a great design, metal leather strap and a dial decorated with a working compass, indicating only the time. However, this device incorporates a micro spy camcorder that records videos in Full HD 1080p resolution (1920*1080). The captured images are clear (no twist, interruptions or delays) due to very good video compression H.264. All video files are saved on the internal memory directly in AVI format. 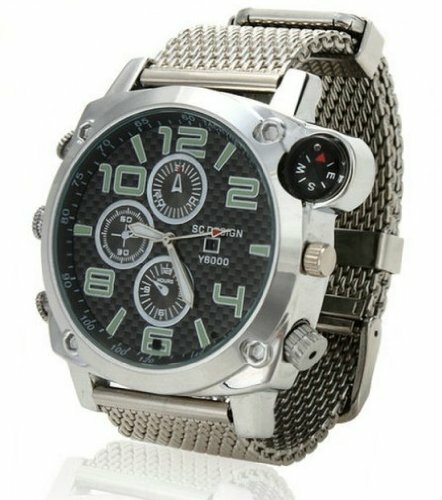 This DVR Watch can be used as a spy camera or recorder having a photo resolution of 4032*3024.Supports AV OUT/AV IN function. The spying device has built-in 16GB memory, which is enough to store approx. 2 hours shooting. Downloading files on your computer is made via USB cable. Each film is accompanied by the date and time it was recorded. Battery life is approx. 100 Min for continuous shooting. Check its price, more models and extra details on Amazon.